Looks like the Verizon "Can you hear me now?" guy, Paul Marcarelli, is about to be the "Can you see me now?" guy, as Verizon is ending its nearly 10 year old campaign and relationship with him. Paul recently talked about life during and after as the Test Man with The Atlantic. 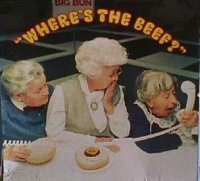 So, he joins the ranks of mothballed advertising icons like the Where's the Beef lady and the Maytag repair man. I admit. He and the ads got me to switch to Verizon years ago, and I don't regret it one bit. From a marketing perspective, I thought the brand strategy and execution was excellent. Verizon carved out a relevant, ownable space around "coverage". The singular focus has contributed to their dominated position in the wireless industry. But brands need to evolve over time with its customers. As Verizon clearly owns "coverage" now, it makes sense for it to take the brand to the next level. In this case, the focus is on "speed." Its recent heavy promotion around 4G LTE and the rapid adoption of bandwidth-hogging smartphones supports the need for speed. If all goes well, Verizon will build on "coverage" and add "speed" to its brand associations.